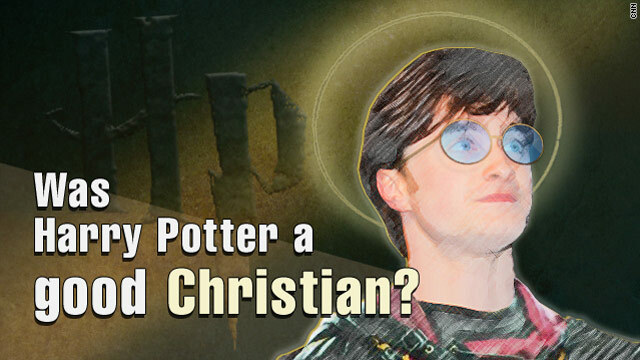 Contributors to this blog have written before about how Harry Potter is a Christ figure. So I’m not going to go into that here. It’s kind of obvious, people! No, what I’m going to discuss is how Harry ceases to be a Christ figure after Voldemort is defeated. Spoilers for Deathly Hallows after the jump, but by now, all of you have read all the books and seen all the movies, right? Harry in the epilogue: Christ figure? Nope. Sappy goody two-shoes figure? Pretty much. So at the end of Hallows, Harry, like Jesus, dies. Then Harry, like Jesus, comes back to life. And then Harry, like Jesus, triumphs over evil. But the parallels between Harry’s story and Jesus’s seem to abruptly end with Harry’s “death” and “resurrection” and his subsequent defeat of Voldemort. Harry even gives up the Elder Wand, the instrument that would have given him “God-like” power, in favor of repairing his old and very human (though still pretty special) phoenix feather wand. 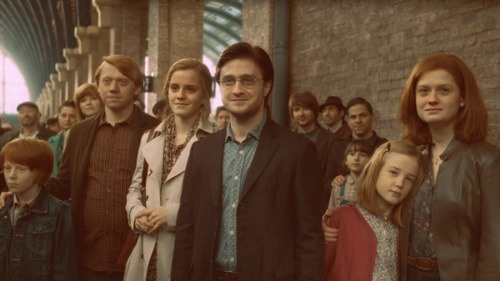 Later, in the epilogue, Harry is depicted as having a normal family life, marrying Ginny and having three children with her, two of whom he sees off on the train to Hogwarts. Harry does not ascend into heaven at the end of his adventure the way Jesus did at the end of the gospels. Nor do people seem to treat him reverently, as if he were a figure worthy of worship. Why do the similarities between Harry and Jesus seem to end so abruptly here? The truth is that Harry’s story is simply evocative of the Christian gospel rather than a close allegory, as The Chronicles of Narnia attempts to be. Harry is, in fact, simply a mortal human being, not divine like Christ. Continuing to live an earthly life allows Harry to continue to love, in such a way that he can show it to his friends and family over and over again through his actions, and pass on this message of love to the next generation. Viewed this way, his seemingly earthly life is already a sort of “resurrection” and “ascension” into heaven. All who love can taste this heavenly existence, one full of life even beyond—in spite of—the grave. Of course, nothing can really compare to the act of love he showed through his willingness to sacrifice his life. But numerous examples of good people who have lived ordinary lives full of love exist. In the ancient Christian tradition, these people are called saints, and contrary to popular belief, not all of them need to be insufferably pious, celibate, or martyrs. Does that mean Harry has been downgraded from a Christ figure to a saint? Yeah, kind of, but that’s okay. There’s one more seeming contradiction here: the ordinary life depicted in the epilogue does not seem completely full of love. The Christ figure’s sacrifice is supposed to open the gates of heaven to everyone, so why doesn’t their life seem heavenly? Divisions between factions still exist; little Albus Potter is afraid to be sorted into Slytherin, and Ron still shows hostility toward the Malfoys, encouraging his daughter to “beat [Malfoy’s son] in every test.” All three of the Deathly Hallows still exist as well, meaning that someone could be tempted by them again. With the divisions between Hogwarts Houses still encouraging enmity, and the possibility that the Hallows could be misused in the future, it is hard to say for sure that someone like Voldemort will never appear again. But again, this is not a problem to a discriminating reader. Jesus’s resurrection did not destroy the possibility of sin either. Evil clearly still exists in this world, just as much as it does in the wizarding world. This is because Jesus’s vanquishing of death did not strip away people’s free will, but instead made it possible for people to choose to follow in his footsteps and have an existence full of life and spiritual significance, both before and after earthly death, even if they do not realize they have made that choice. Harry’s efforts accomplish approximately the same goal. Through Harry’s actions, the whole wizarding world was able to see how love conquered death on the battlefield between Harry and Voldemort. This left them with a demonstration of supreme self-sacrifice and self-denying love, which they could choose to emulate, or not. It is simply a realistic depiction of the fallen world we live in that not everyone in the epilogue manages to love perfectly. So yes, after the defeat of Voldemort, Harry is no longer a Christ figure, and he doesn’t bring the Kingdom of Heaven to earth. But that doesn’t nullify the message of the series in the slightest. The Harry Potter books are not a perfect allegory for the gospels. In fact, I think if they were, a lot of people would find them unrealistic and not want to read them anymore. Rowling has found a good happy medium, where the Christian symbolism is still obvious, and good examples of self-sacrificing love are presented—but just like in the real world, nothing is perfect and there’s always further work to be done. This entry was posted in Harry Potter, Oh My Pop Culture Religion, opinion, Religion and tagged Christ figure, Christianity, harry potter, Religion by syngraphea. Bookmark the permalink. This is perfect, right and probably one of my favorite posts made under this topic 🙂 Gives new meaning to the books and the character! Oh wow, thank you! I’m glad you think so! This was part of a long paper I wrote in undergrad on resurrection symbolism in Harry Potter. Out of all of it, I think this was the least obvious thing I wrote (the rest of it was basically, “Harry’s actions: good! Voldemort’s actions: bad!”).